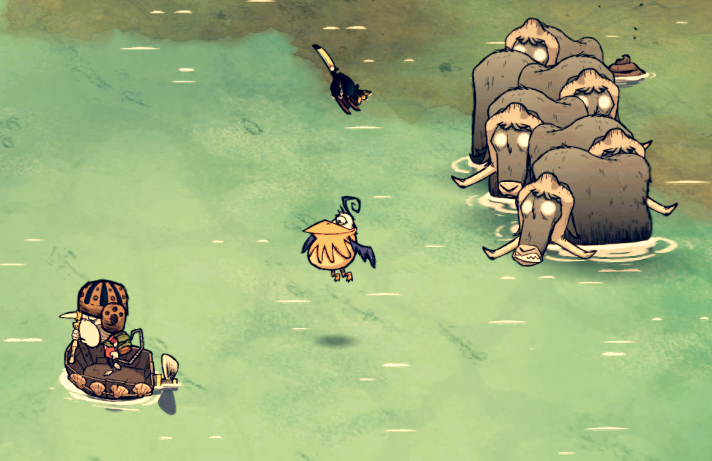 The water beefalo being a shipwrecked equivalent to ROG beefalo. This would make is so it could swim in water and walk on land. There aren't any Water Beefalos available in DST and Water Beefalos can't swim! They're walking on the shallow water in the mangrove biome. You won't be able to move them over to your island by aggroing one and sailing to your island, they'll just stop cause they can't swim. @ImDaMisterL, use your normal Beefalo to help move this thread elsewhere. Thank you for your report. Would you mind posting such things HERE next time? Don't worry guys, it was moved. Thanks for the suggestion, OP!